What is this amplifier doing, exactly? I'm going to show my ignorance of how transistors work here, but whatever. I'm hoping to improve my understanding. I didn't have a BC337 so I used a BC546 instead. I connected a 6 ohm speaker from an old portable radio/cassette player. It worked great in that it gave nice loud amplification of the tones from the Tone library. Measuring the input signal (from the Arduino pin, in yellow) compared to the transistor collector (blue) shows the amplification isn't perfect, but not too bad. What is the purpose of the amplifier? Impedance-matching? Current amplification? Voltage amplification? Is the ringing around the rise and fall expected? Could it be improved somehow? Are there any "gotchas" in there? Like, drawing too much current through the transistor, or something? If I wanted to implement a volume control, what would be the recommended way of doing that? Is the purpose of the 100K resistors to bias the transistor base? What is the purpose of the 10 ohm resistor? To limit current? Is the purpose of the 2.2K resistor for impedance-matching? Impedance matching and current amplification is the save thing so a bit of all of them. Yes it is quite a simple amplifier. I would include a 0.1uF cap between the pin input and the amplifier input. Put a pot directly on the output and connect the wiper through a cap to the input. I like that ABC guide a lot, but I would not use this circuit. I even think it is really bad. If the output pin of the Arduino is not set as output, the two 100k resistors will turn the transistor on a little. The two 100k resistors makes the amplification a little analog, but the Arduino output pin is purely digital. So I would remove both 100k, and perhaps add a flyback diode over the speaker. Nick, you can't rely on the measurements. The BC546 can do 100mA, and this circuits requires 278mA. The BC337 is a transistor that can handle 800mA. The BC337 is a transistor that can handle 800mA. Och, well I'm about to order a hundred or so. "Cheaper by the dozen" is the motto. The BC546 can do 100mA, and this circuits requires 278mA. If you could explain that calculation I would be grateful. I read the datasheets for the maximum current of the transistors. The current is 5V / (10 + 8 ohm) = 278mA, assuming no voltage drop of the transistor and the transistor being fully on. At 278mA the BC337 has Hfe of about 250. So the 2k2 will turn it into saturation. The NPN BC337 is an old transistor. 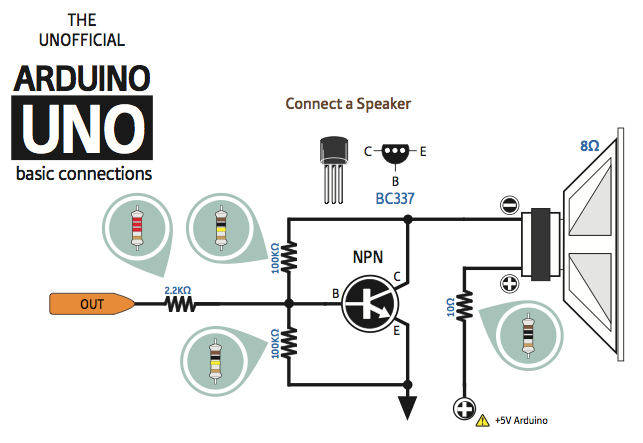 The NPN BC639 is a little newer, it can do 1A, and it has the BC640 as complementary PNP. @ Mike the only point I'd disagree with you on is the input resistor and that is to limit the base current to a safe value. 2K2 is 50 times the "bias'" resistors and as such will have little effect on their operation.. A .1 to 1uF cap (depending on the desired low frequency response) should work well with the 30 k or so input impedance presented at the base lead. The initial intentions were to make an amplifier as simple as possible (with only 1 cheap transistor). There are several modifications that can be done, especially include a capacitor between the input pin and the amplifier. Checking diagrams is a good thing from you because for surely there are people better than me in this forum and together we can do a good job for everyone. I am extremely grateful for your insight. 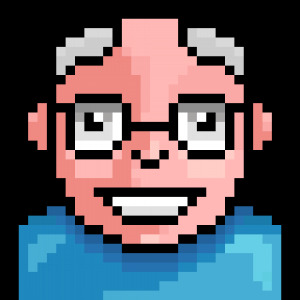 @pighixxx - I am testing to check my knowledge is sufficient to understand your diagrams, and if things don't work perfectly I'm keen to understand why. Perhaps it's my fault. That amplifier is a "Class A" amplifier. Theoretically, it is supposed to be biased so that with no signal, the collector sits at about 1/2 Vcc (so that it can swing UP to VCC and DOWN to GND). The resistors on the base circuit create a bias (base current * beta = collector current) to keep the transistor conducting (that is, in a Class-A mode). The top bias resistor is connected to the collector to provide NEGATIVE feedback and stabilize the bias. That is, if the bias is too "strong", the collector will go lower and decrease the base bias, thereby self-stabilizing the circuit. I would try this for fun: Remove the 2.2K resistor between the Arduino and the transistor base and replace it with a 1 uF (not critical) capacitor (positive side to the transistor base). (edit to add): If you take the "Class A" sketch and invert it so that the "spring" is at the top, that is basically the same as your circuit - and BJT vs MOSFET doesn't matter - they both do the same jobs - albeit in a different way. (edit to add more): Notice that the Class B amplifier "rope" needs to be taut, otherwise there will be a small "dead zone" where the speaker doesn't move. The tension on the rope is the bias, and if there isn't enough bias and the rope is loose, the dead zone on the speaker is called "crossover distortion". This is the amplifier I have in my fencing scoring machines, driven by a burst of Tone to make a nice two-tone warble when a touch is scored (sounds like cell phone ring). When input is Low, transistor is off, cap keeps any DC from flowing into the speaker, but the yellow wire sits high. When input is High, transistor turns on, pulls cap low to move speaker one direction. When input goes back high, the cap goes high and the transition thru the cap drives the speaker the other other direction until the cap charges up again. So Tone makes a nice sound with this MOSFET and speaker. The 68 ohm resistors were an attempt at high/low volume control - my wife says it is still way too loud. frequency response, since the speaker impedance is so small. the problem of continuous current burning up the speaker. 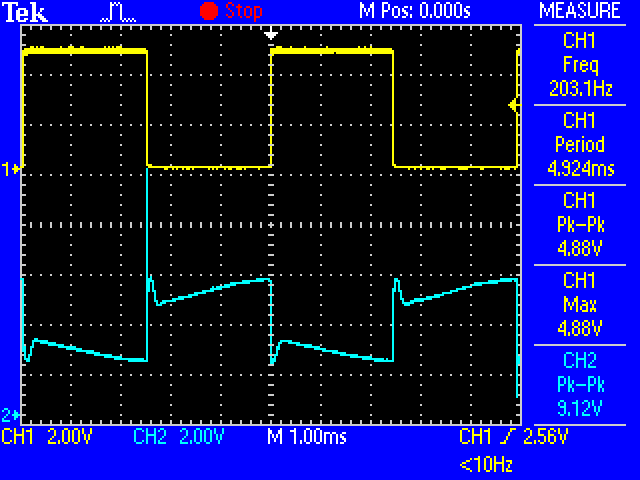 Why is there that current (which incidentally the scope trace appears to agree with)? If the transistor is "off" it shouldn't be conducting, should it? Or does the biasing keep it on? I guess it must be that, because on the scope it looks like when the input signal is off, the output signal is around 2.2V. don't need to capacitor-couple the speaker. low-pass filters ahead of the amplifier to smooth out and anti-alias the PWM.